We made it back to the Lazy OD Ranch Monday evening and finished a 1,759 mile loop. All day while I was driving I had thoughts of parking the bus when we arrived and throwing myself into a house project until bed time. When I stopped for fuel about 35 miles before home, I changed my mind. My brother Steve followed the BoggsMobile in the drive in his little red car. He was going to take care of a few things here, so we were able to visit with him for a few minutes. That was a very nice welcome home. We unhooked the Green Machine, turned the bus around, backed into the barn, looked at the inside of the house, visited with Steve and then I laid down for a three hour nap. When the nap was over, I laid down for the night and slept until about an hour ago. I think I am on a roll! Speaking of the house, Papaw Danny has been painting while we were gone and it all looks terrific! I will try to post some more pictures this week. To sum up the quick trip to Vermont, we drove 1759 miles, admired the absolutely beautiful views, visited some old friends, made a bunch of new friends, were blown away by our dear friends the Mayhans from Oklahoma, had four blessed services, heard wonderful testimonies of what God's Word performed in lives and returned home safe and sound. It was a super great weekend! 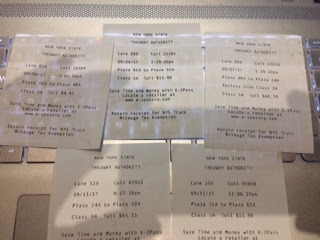 Oh, and we paid $162.10 for the distinct privilege to drive on I-90 in New York state! Wow! I guess there was one thing that was not great. As most of you know, our plan was to swing through here, pick up the tent trailer and leave immediately for Richton, Mississippi. NOT our friend Irma interrupted those plans. She is making here way through our route to Mississippi right now so we will leave in a day or two or three instead. We will keep you posted. Thanks for stopping in to chat today.